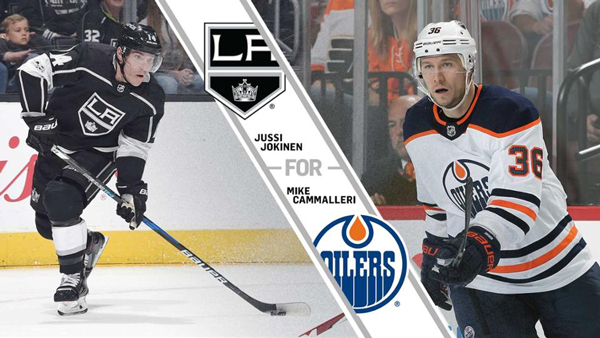 The Los Angeles Kings have acquired forward Jussi Jokinen from the Edmonton Oilers in exchange for forward Michael Cammalleri, Kings Vice President and General Manager Rob Blake announced on Nov. 14. Jokinen, 34 (born April 1, 1983), has played in 14 games with the Oilers this year, recording one point (0-1=1) and two penalty minutes. The 6-0, 191-pound native of Kalajoki, Finland has played for the Oilers, Florida Panthers, Pittsburgh Penguins, Carolina Hurricanes, Tampa Bay Lightning and Dallas Stars during his 13-year NHL career. In 905 regular-season games he has posted 547 points (186-361=547), a plus-2 rating and 367 penalty minutes. Drafted in the sixth-round (192nd overall) by Dallas during the 2001 NHL Entry Draft, he has appeared in 54 playoff games, posting 32 points (17-15=32), a plus-10 rating and 20 penalty minutes. Cammalleri appeared in 15 games this season with the Kings, posting seven points (3-4=7), a plus-1 rating and four penalty minutes. The Kings’ five-game homestand continued tonight as the club hosts the Vancouver Canucks at 7:30 p.m.